Over the years, you’ve sent me quite a bit of random stuff with no explanation. Vera dishtowels, hanks of yarn, toile pillows. I take it all with gratitude and sometimes mystification. 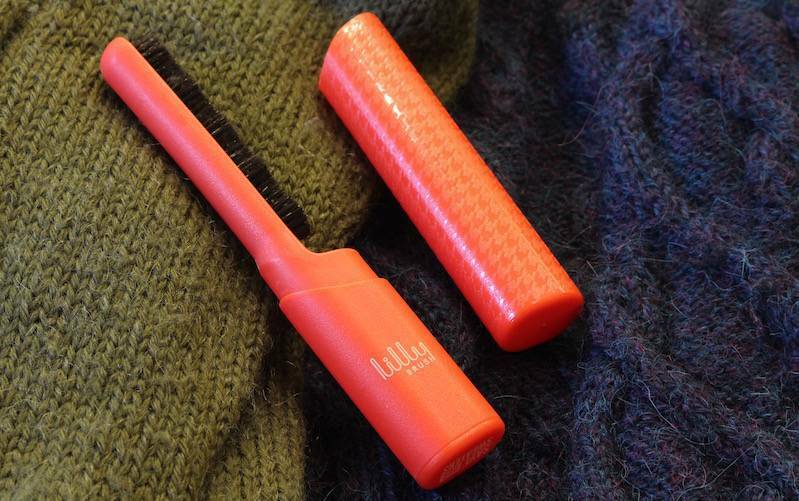 The Lilly Save Our Sweaters Brush. Rolling toward the conclusion of my six-sweater Washathon Washalong, this Lilly Brush is front and center. Two of my washalong sweaters had pilled enough to leave me looking waifish and not the good kind of waifish: Heather the Almost Lost Sweater from 2002, and Laurel the Alpaca Pullover/Antarctic Survival Suit. It’s nothing more than a narrow bristle brush. It’s not electric, like those sweater shavers that scare the crap out of me and look like they’d burrow into my stockinette like a wood beetle. It’s not like those pumice sweater stones that leave gray crumblets in my sweater. It’s just a brush, and when you swipe away at your matted sleeve, it looks better. It doesn’t repair your terrible mattress stitch technique from 2002. And it’s not a magic wand. But sometimes a low-tech gizmo can be just the thing. I leave you with the only creatures more interested in my freshly washed sweaters than I am. Kermit drew close and breathed deeply, deeply. PS Thanks so much to everybody who took part in the Great Emily Ringelman Dry Out Event over the past two days. Emily writes that she’s got a six-month rebuilding project ahead of her down in Baton Rouge. Here’s a video of her house at the moment—where’d the bottom part go? Hundreds and hundreds of patterns were bought—she’s so grateful for the help. Take a peek and buy a pattern if you haven’t had a chance. 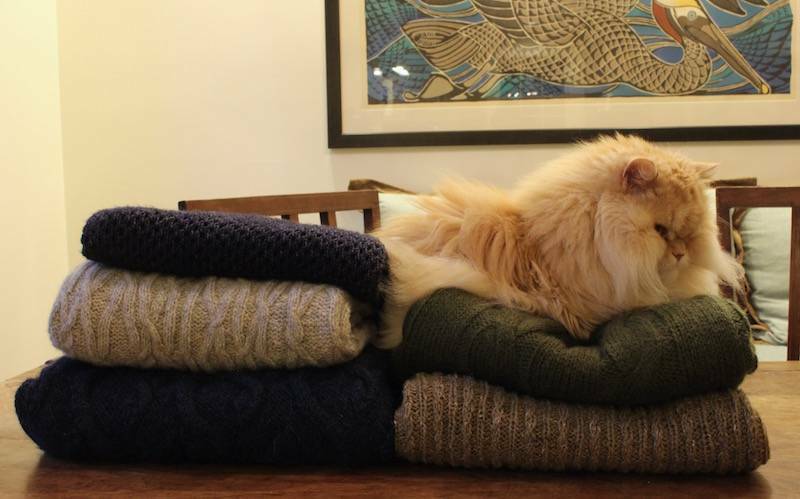 Is that your Carpino in the middle of the Glorious Pile of Washed Sweaters? It’s looking great. Is the high neckline a problem at all? I have the Lilly and I love it. And it is easy to throw in a suitcase. I would love to own a stack of me-made hand knitted sweaters! I am blessed by this blog and it encourages me to continue steadily ahead. Thanks for sharing even the small stuff! I had what may have been the protoype for this sort of brush. It had a wooden handle and brass bristles. Actual brass. Like a giant version of the little brass brush you might use to clean copper fittings. Now I’m wondering what I did with that thing…it was just one of the mysterious items I found in my little shack when I bought it many years ago, and I kept a lot of that detritus out of a sense of responsibility to baffle the next generation of shack-dwellers. I bought a Gleener after a sweater stone kept crumbling away. Hmmm…I wonder how well the Lilly brush would work on something else that can get pills. Oh, Elliott…. Thanks for the reminder about Emily. I chose one of her cardigan sweater patterns. I’m a huge fan of the Gleaner. 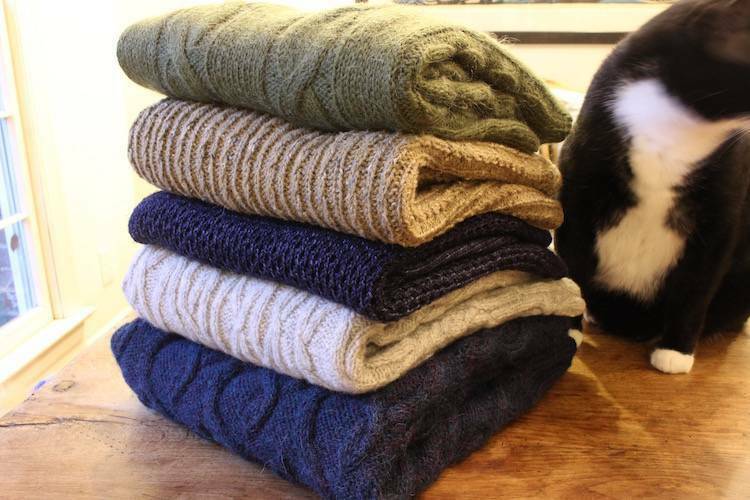 It is so much fun that when I ran out of sweaters to de-pill I started on my wool blankets! Comes with 3 attachments for de-pilling to match the weight of the sweater yarn, plus a lint brush, all on a very ergonomic handle. You can de-pill for hours with no wrist pain. What joy! Not that I’m knit picking (ha ha) or anything but I only see 5 sweaters in the photos. Dare I ask what happened to the 6th. 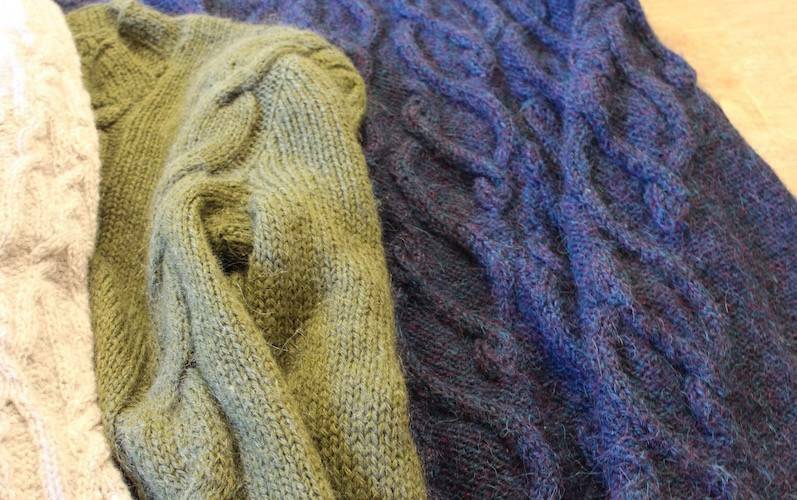 The life-changing magic of tidying up your sweaters. I think I got that brush because I saw it on Knitter’s Review with a rave. I wonder where mine has gotten to…. I, too, love the Lilly brush. I thought it just another gizmo until I used it. And I bought a couple of Emily’s patterns. Thank you both for being such a great communication link to a community of knitters. I have the smaller Evercare Shaver and it works well. I would have thought a brush would only cause more of a pill problem, but I trust you two, so it must be a good thing. Easier and better for travel too. And no batteries required. Thumbs up! could elliott be thwarting and undermining any and all sweatertidying efforts ? Elliott and Kermit obviously approve. Have Elliott and Kermit ever toyed with your needles? I’m sure they are far too well behaved. So has anyone ever managed to smooth out a cable after a kitten attack? Why yes, I have a new kitten. Only 2 circs have been chewed. So far. The sock cuffs are fine, thanks. I had a wonderful cat who chomped any circular needle he could find. He also chomped wooden straight needles. He never grew out of it, but I loved him nonetheless. I love the Lilly brush… Anyone who’s not familiar with it should be aware that it works only on 100% animal fiber, it’s almost useless on pilly blends. I give these as gifts to all my sweater-wearing gal pals. I love Elliott. His respect for that sweater is manifest. Great Ringleman patterns. I look forward to the Rehoboth. Pilling is truly my bete noir. I feel so discouraged by it after favorite sweaters are coated by hideous fuzz balls. I read the Good Housekeeping article, and it turns out to my chagrin that the sweater shaver I already have and find mostly unsatisfactory is one of the top rated ( the small one). What hope is there? Hmmm. Should I try this Lily brush? I suppose I will give in and try it, as I love gadgets. The Mason Dixon braintrust should put its collective minds to finding a truly workable solution. The world needs this! Already done. It’s called The Gleener. Awesome tool. Get one and you’ll be begging your friends and neighbors for stuff to depill. I want to try the Gleener. I heard it was good also. But in the meantime, I wanted to report that my Lilly brush arrived from Amazon last night, and it actually works amazingly well!